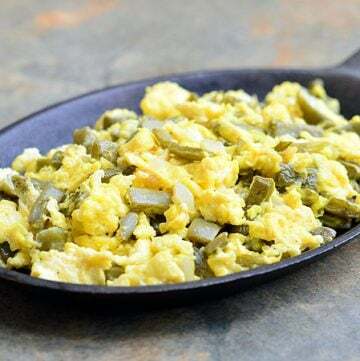 Nopales con huevos is a classic Mexican dish made with prickly pear cactus and scrambled eggs. 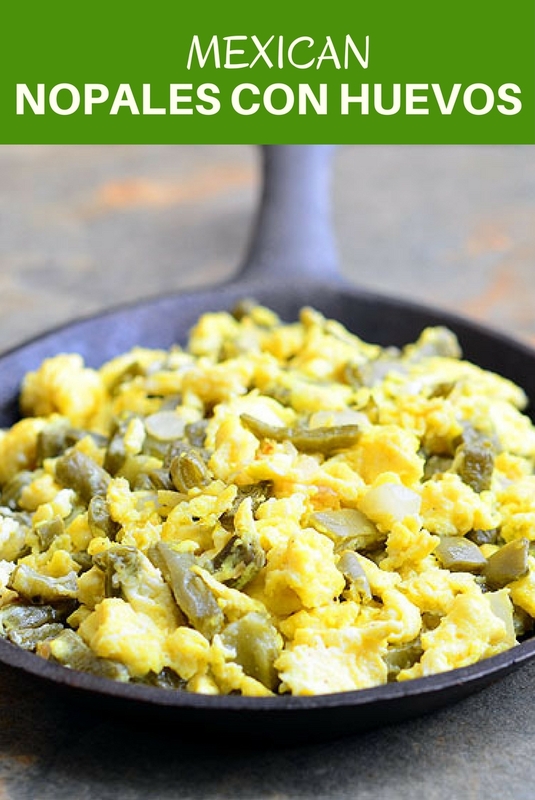 Packed with protein and amazing health benefits, it’s a nutritious and delicious breakfast you’ll love waking up to! I am not really big on vegetables as I should be and if it weren’t for my food blogging, these nutrient powerhouses won’t even figure in my daily diet. But boy, do I love nopales! Mondays to Fridays on my way to work, I pass by without fail at my favorite Mexican restaurant to order their $4.95 daily special of nopalitos con huevos with Spanish rice and refried beans. And as if Mondays to Fridays are not enough, I always keep a paddle or two of this prickly pear cactus to enjoy as a fresh salad dip for tortilla chips or as meatless filling for tacos. Nopales are a relatively cheap vegetable option with a hefty cactus paddle enough to comfortably serve a family of four at around $2. They are, however, a little tricky to prepare what with the outside skin peppered with nubs and spines. Please make sure to wear gloves to protect your hands, the pointy spines can be rather painful! If you want prefer not to wrangle with the fresh variety, they’re available bottled, canned or already trimmed and cut in bags at most Mexican supermarkets. 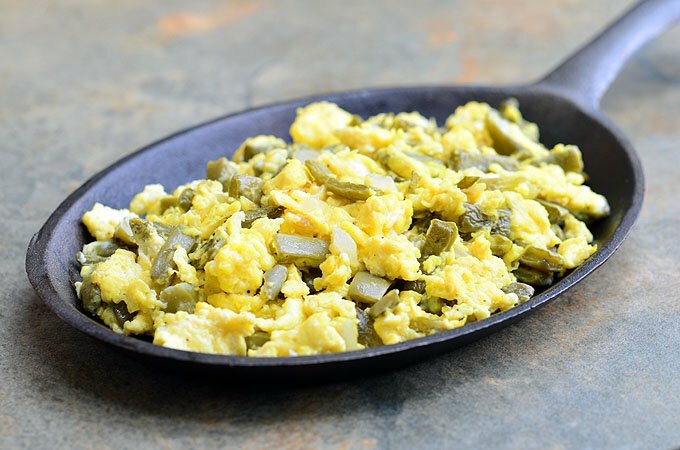 Nopales con huevos is a classic Mexican dish made with prickly pear cactus and scrambled eggs. Packed with protein and amazing nutrients, it's a nutritious and delicious breakfast you'll love waking up to! Using a small paring knife, clean the cactus paddles by scraping thorns or spines from both sides. Trim off the edges and any blemished or discolored areas. Wash well with cold water. Cut the paddle lengthwise into half-inch thick strips and then cut crosswise into 1 to 1 1/2-inch lengths. In a saucepot over medium heat, combine garlic, about 1 teaspoon of salt, and enough water to cover nopales. Bring to a boil. 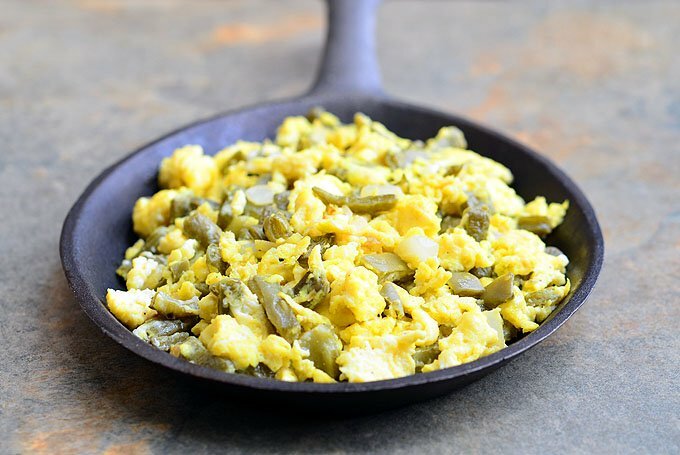 Add nopales and cook for about 20 to 25 minutes or until nopales have changed color and are tender yet crisp. Drain nopales and rinse well under very cold water. Rinse again as needed to rid of mucilage. In a skillet over medium heat, heat oil. Add onions and cook until softened. Add nopales and cook for about 2 to 3 minutes. Add eggs and cook, stirring regularly, until eggs are set but still slightly wet. Season with salt and pepper to taste.
. Remove from heat, garnish with chopped cilantro and serve with warm tortillas. Thank you some much for this recipe. Thank you so much, Crystal. I hope you enjoy recipes. This was wonderful! I have never cooked them myself before. I was making them for my grandmother who is not doing well, and even she approved! Taste and texture were spot on she said! Thank you! Thanks for the feedback, Cat. I am glad grandma liked it. Praying for her fast recovery.